An easy to use, yet fully featured multipurpose calculator and unit convertor. -Save the operations and the results as a text file. -Use "V" symbol for square root, visualy closer to classic math, also works with or without parenthesis. -Cos(X) Sin(X) Tan(X) etc works with or without parenthesis. -Intuitive, customizable, skinable HTA interface, in another word: Cool! where it suits you best (no further installation necessary). On Windows VISTA/7 you cannot install this program in  "Program Files"
or in "Windows" or one of their subfolders. or in one of the user's "Document" subfolder. On Xp avoids the "Windows" folder. The best is still to follow the rules for Vista. On w98, you can install it wherever you want. -If you want, create manualy a shortcut to your desktop or to the quick launch linking to this file. ...then hit the "ENTER" key energicaly or click "Calculate"! Well, I hope the interface is intuitive enough and that you don't need to read anything more. Save the very important warning bellow. If something is not clear when you use this program, just look here. DO NOT USE COMAS OR DOTS AS THOUSANDS SEPARATORS. but I prefer not to do so in order to avoid mistakes in case of wrong configuration. Whit white spaces there is no mistake wherever is your location in the world. Dots and comas are always interprated as decimal separators. no matter your region or your computer settings. but 2,300 will be read as 2.3 and 2.300 will also be read as 2.3! 2.300.200 will return an error. You can use as many white space as you want, wherever you want even several white space in a row. It doesn't have to be thousand separators. Whte spaces are simply ignored. You can write ² and ³ as well as simple 2 and 3 to mark them as square and cubic. Example: ²V and 4² and m² are all accepted. To make your formula shorter and simplier you can use demultiplier symbol such as K,M,G or T.
This will avoid typing long series of zeroes when working with large numbers. K (Kilo) multiplies the number by 1000. M (Mega) multiplies the number by 1000 000. G (Giga) multiplies the number by 1000 000 000. T (Tera) multiplies the number by 1000 000 000 000. ATTENTION: These are the only symbols which are case sensitive. This means that "M" won't mean the same thing as "m". "M" will mean "million" while "m" will mean "meter". You can also ask the program to use these symbols in the result. See Output Options below. This is very useful when working with high numbers. K (Kilo) will divide the result by 1000 and add the symbol "K" at the end. M (Mega) will divide the result by 1000 000 and add the symbol "M" at the end. G (Giga) will divide the result by 1000 000 000 and add the symbol "G" at the end. T (Tera) will divide the result by 1000 000 000 000 and add the symbol "T" at the end. This function is disabled when the result is inferior to 1/10th of the demultiplier. the function will ne be triggered and it will read "90". If the result is 200, then it will read "0.2K". In the ini file, enter "" (empty quote string) to disable this function. be contained within doublequote marks (example: Demultiplier = "K"). You can use these multiplier symbols in your formula as explained above. The number of decimals will be reduced down to the number of decimal entered. It will also remove unnecesary zeroes. In the ini file, enter -1 to disable this function. This will improve the readability of long numbers. Why not separating thousands with comas? so I decided to use white spaces to avoid problems with the program. Changing the display option doesn't remove or disable the function shown by the buttons. All the funtions remain accessible through the keyboard. the button to include them in the formula. Click the "Options" button, then click "OK" or "Minimalist view" to get the smallest window possible. While under minimalist view, click the "..." button to return to the option table. (Useful for finding the right unit symbol when doing conversions. (They are on your keyboard or very simple to type, so in fact you don't realy need these buttons. what you have written with the intiutive interface. It's useful to debug errors or see what happened when the result looks very wierd. (Shows all the operations you have done during the session. The list is erased once you close the program. Horizontal : Will strech the window to screen width and display item horizontaly with minimal height. Vertical : Will strech the window to screen height and display item vertically with minimal width. Full Screen: Will cover the entire area of the screen. 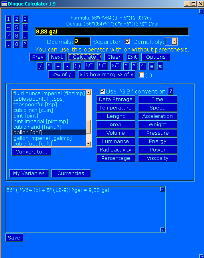 Options are saved in "DingueCalculator.ini". This is very simple. Just type the usual symbols. At the end of the formula, type "?" followed by the unit you want to convert to. It's recommanded to ALWAYS TYPE THE UNITS IN LOWER CASE. are interpretated as multipliers and the letter v.
Attention you must always assign a unit after each number or use parenthesis. In fact a unit is equivalent to using the   *    sign. It multiplies the number or the parenthesis before it. You can compose complex units by using "/" between two or three symbols. Variations are only limited by your imagination. sqmi (square mile), cumi (cubic mile). You can write ² and ³ or simple 2 and 3 to mark them as square and cubic. Example: m2 and m² are both accepted. You can use ' (for feet) and " (for inches) instead of ft and inch. there is no need to add a + between feet and inches. 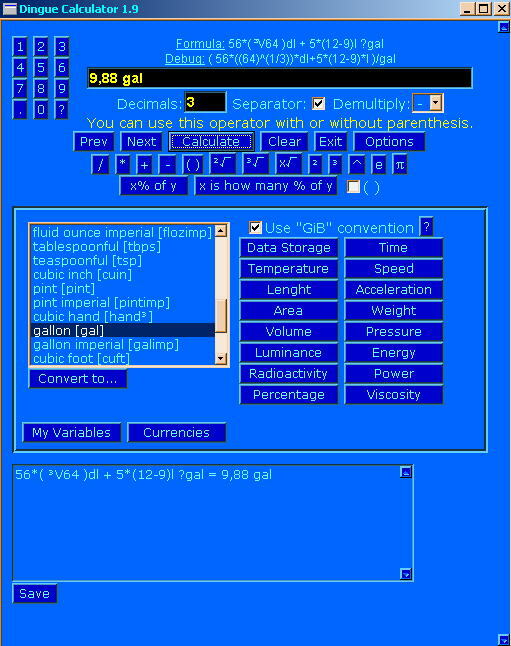 Dingue Calculator allows two uses of data size unit symbols. One commonly using only Kb, Mb, Gb etc and the IEC prefix convention using Kib and Kb, Gib and Gb etc. What's the effect of enabling "GiB" IEC convention? by 1000, 1000 000, 1000 000 000 and 1000 000 000 000 respectively instead of 1024, 1024*1024 etc. In this case you need to use the symbols "Kib", "Mib", "Gib" and "Tib" to multiply by 1024, 1024*1024 etc. More informations on Wikipedia (http://en.wikipedia.org/wiki/Binary_prefix) or in "GibConvention.hta". The file "currencies.txt" contains a list of currencies and their value in US dollar as of 14th of May 2010. !!! YOU MUST UPDATE THE EXCHANGE RATES MANUALY BEFORE CONVERTING CURRENCIES !!! There is no automatic currency rate updator with this program. Therefore you are the only one responsible for the accuracy of the exchange rates. Of course, you can update only the rates of the currencies you need at your own discretion. You can edit the list of currencies manualy in Notepad or similar text editor. You can add or remove entries. The list proposed is only a sample. its symbol and its value relative to the US dollar. The symbol is what will be used in the formula and must be written under brackets after the descripton. The value relative to the US dollar must be indicated after the   =   sign. punctuation mark, symbol, non-latin character, hieroglyphe or any non-alphanumeric character. The description is everything before the first open bracket [ . Here: Pound Sterling. US dollar (USD) is equal to 1. In the calculator type the international symbol of the currency or click in the list of currencies. You can type them in lower or in upper case. It makes no difference. removing the   '   sign in front of it. To disable a currency add a   '   sign in front of it. This is useful to make the currency list in the calculator shorter. Customized variables are your personal variables, that you create yourself. Attention: These variables cannot be used as convertion units. They basicaly replace numbers that you want to use often. They are listed in "my_variables.txt". The format is the same as for the currency list. Each variable has a name and a symbol: The name is for description only. The symbol is what will be used in the formula and must be written under brackets after the descriton. The value must be indicated after the = sign. IT'S RECOMMANDED THAT EVERY CUSTOMIZED VARIABLE SYMBOL BE PRECEDED BY "$". it will know that you mean your personal variable "$m" and not the lenght unit "meter". they don't exist anywhere else in the program. a currency symbol, a variable used by the program itself or an mathematical operator. If you type $ alone, well,... it will be interpretated as USD, the currency symbol for american dollar! Please note that the names of your variables is NOT case sensitive. This means that the variable "$joe" will be the same as "$JOE", "$jOe" and "$Joe". by removing or adding the   '   sign in front of it. after a single quote mark (or apostrophe) like this:  '   . but not with  non-alphabetic symbols  (eg:   +  -  *  /   ) and not with "V". With the symbol "V" (square root), the variable symbol can be used without parenthesis. will not give any error and will give the cubic root of x.
will not give any error and will give the root of 25 as x as root power. If x=2, it will give the square root of 25 for instance. There is a "Save" button near the list of previous operations. click the "Options" button and enable "Show the mathematic operation that had been done". Change the destination folder in the Options if necessary. Then click "Ok". Click "Save" and enter a file name in the input box which just poped up and here you go. Every command is typeable on the keyboard. Typing a symbol is exactely the same as getting it by pressing a button. even without seeing these buttons at all. Type " pi " to have the value of Pi. Type " ^ "  to raise a number to the power of an exponent. Note that   ²   and   ³  are both valid symbols equivalent to  ^2  and  ^3   . Type "V" (UPPERCASE!) to get the square root of a number. "V" must always be written in uppercase, not "v"
in the "V" square root range. of this number (root power limited to two digits). NOTE: In the text returning the formula  "V" will be transformed to a an equivalent form of "^(1/2)"
and "3V" will be transformed to a an equivalent form of "^(1/3)" etc. NOTE: You can use "pi" as a root power. You can also use "sqr( )" or "^(1/2)" instead of "V"
Why is there double parenthesis in this formula? it will give you a wrong result with these additional parenthesis. For the same reason it allows to use convertion units in this formula. Will count how many percent makes 25 square meters in 56 square feet. in the list of customized variables in "my_variables.txt". need to be between parenthesis anyway. Otherwise their name will melt with the operator name. If you are confused, always use parenthesis. Added setting dialog for default folder and file name to avoid "file not found" error. Added squareroot as "V" as well as "Sqr( )" or "^(1/2)"
Fixed a bug in temperature conversion which appeared in v.1.1. This bug didn't exist in previous verions. Fixed other minor bug with units conversion. Square root uses "V" uppercase only so that "v" lowercase can be used into variables. Debug errors when the operation entered is invalid or when the program cannot interpretate it correctly. Added ' and " symbols for foot and inch convertion units. Fixed potential errors with the use of   ²  and  ³  . Fixed nez bug with square root sign "V". Free for non commercial purpose. This scripts is under copyright protection. This script is provided freely and without warranty. or indirect use of this script or the inability to use it. it's impossible to guarantee that they will always be acurate.